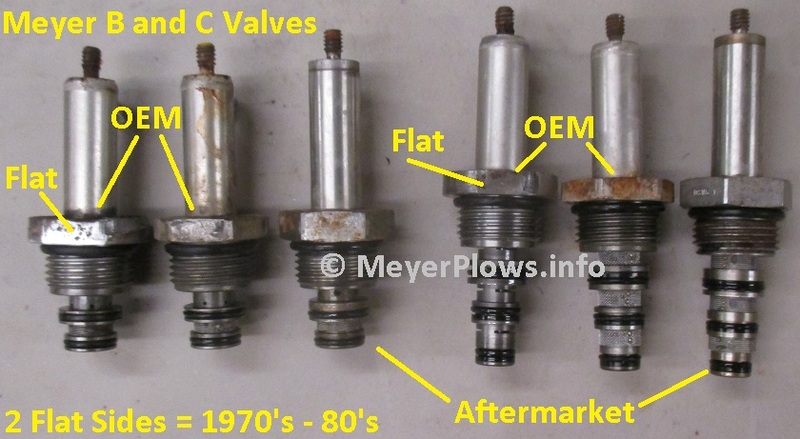 MeyerPlows.info - Meyer Plow B and C Valve Information. Here are the two most common you may come across. 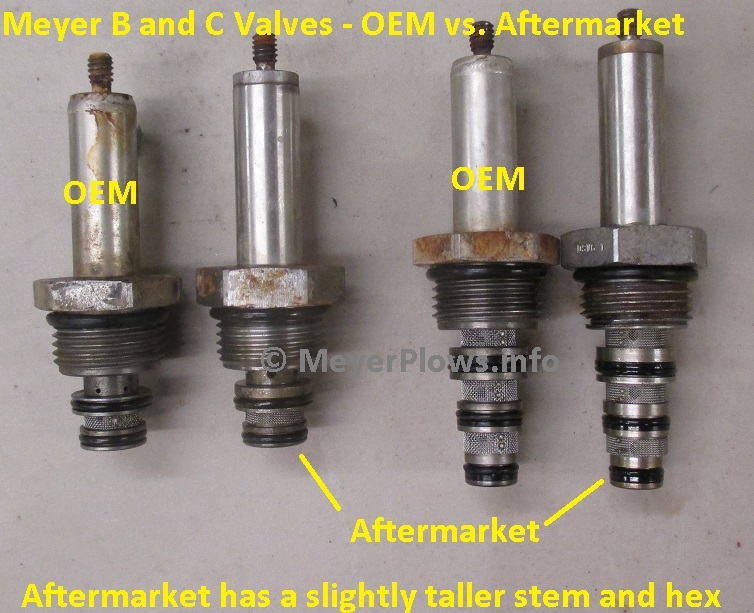 On the left is the OEM Genuine Meyer version, and on the right is the aftermarket version. The aftermarket has a taller stem and a slightly taller hex. The part that threads into the PA Block is identical. The stem diameter is identical. There is no smaller version like the A Valve (3/8" stem or 5/8" stem). These are the original version of the B and C Valves from the 1970's into the 1980's. 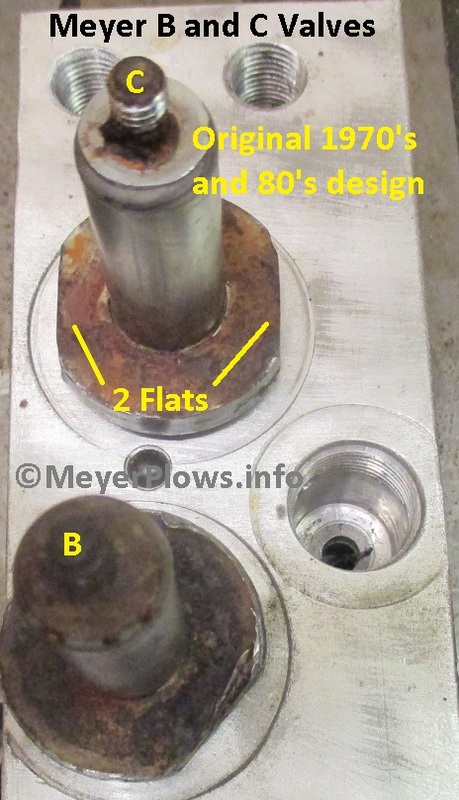 They do not have a hex, instead they have two flat sides that makes it difficult to remove them without the special socket Meyer used to offer (it is no longer avaiable). The stem height is the same as the later hex version, and so is the stem diameter. Here they all are now side by side. 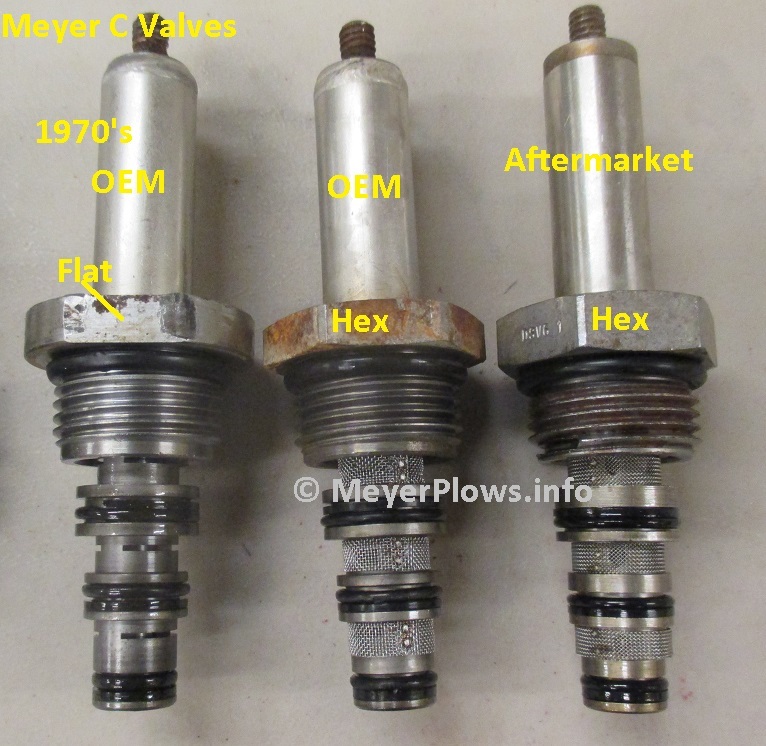 Here is a closer look at the 3 versions of the Meyer B Valves side by side. Note that the OEM ones in the picture are the older versions. You can see the small holes in them. the aftermarket has larger holes, it is a higher flow than the old design OEM B Valves. Meyer changed the B Vavle so it has a higher flow than those OEM pictured here, just like the aftermarket one. Higher flow allows the unit to raise a little faster, not much, but a little. 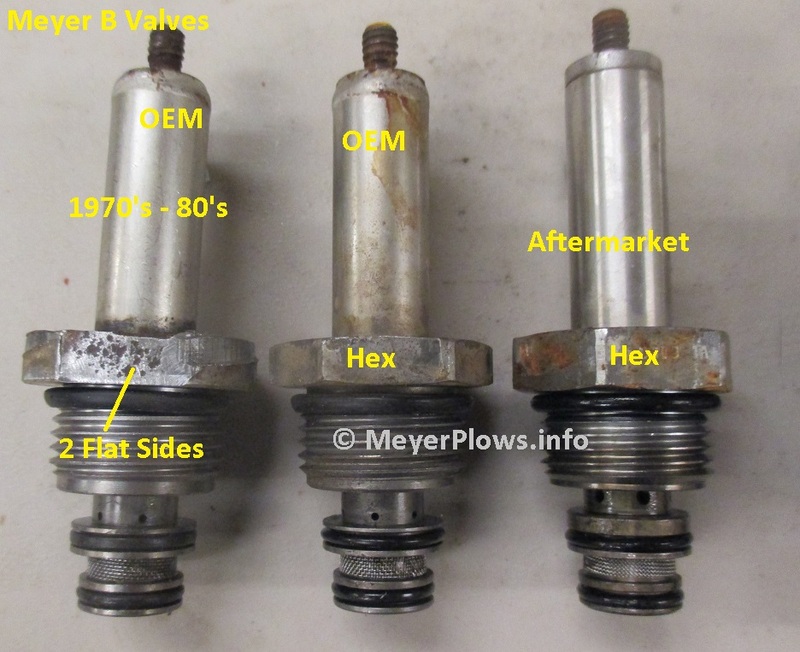 Here is a closer look at the Meyer C valves side by side. Note that the original design with the 2 flat sides does not have screens on it to prevent larger pieces of debris from lodging in the Valve. This is one reason why 99% of the time when a unit comes in for rebuild with one of these I replace it with a new one. The second reason is that once the unit leaves here, with the hex it is much easier to remove the Valve in the field. I often have to use the special socket and an impact gun to remove them. This makes it clear they are original and had never been removed before. Many come in chewed up from a pipe wrench that was used to remove them at some point. The biggest complaint I hear about the aftermarket valves is that the Coil does not completely cover the hex of the valve. When 12v is supplied to the coil of wire, it creates magnetism. This is why telephones use solid wires, because when you twist and coil wire, it creates magnetism when power is applied. I sell A LOT of Coils, because the rumor is "Oh your plow won't (lift, lower, angle left, angle right) you need to replace the selenoids" and yes, they all misspell Solenoids. The fact is, 99% of the time the COILS are fine, it is the Valve that failed. Coils have no moving parts, so unless the wire breaks inside and they short out when power is applied, or they lost their ground, there is nothing to stop them from working. They ground through the Valve stem nut on top. I still get pumps in for rebuild from the mid 1970's with the original Coils on them working fine. I usually replace the Valves for reasons mentioned above, but not the Coils.